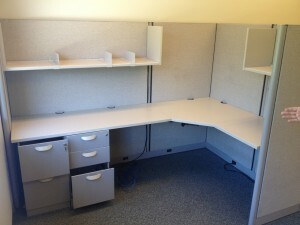 These GF cubicles are 66” high and we have them stocked in a number of different configurations. These are: 5×5, 5.5×5.5, 8×8, 7×7, 8×5, and 8×5.5. Each station has the following features: two overhead shelves, a task light, as well as a locking pedestal. We also have some mobile BBF and FF pedestals available. Each of these stations (over 250 available) includes a base-in power feed. Product is 9/10 as-in condition, and ready to be shipped. No Comments on "used General Fireproofing 8×5 cubicle"